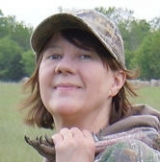 Becky Humphries, NWTF’s chief conservation officer. Bass Pro Shops Outdoor World is broadcasting from the National Wild Turkey Federation’s annual convention, held Feb. 12-15 at the Gaylord Opryland Resort and Convention Center in Nashville, Tennessee. Two great guests will be joining host Rob Keck: Matt Van Cise, five-time reigning NWTF Wild Turkey Bourbon Grand National senior champion, and Becky Humphries, NWTF’s chief conservation officer. The hour long show airs Saturday, Feb. 14, 2015, at 10 a.m. and 5 p.m. Eastern time on RURAL RADIO SiriusXM Channel 80. Matt Van Cise, turkey calling champ. Hunt initiative will be one of the topics Humphries will cover during her interview. Humphries will also discuss NWTF’s new Palmetto Shooting Complex in Edgefield, South Carolina, and how the NWTF is working to introduce more people to hunting.